See Equine Assisted Learning in action! Watch an actual Equine Assisted Learning program that was conducted for the Battle Command Training and Integration Division of Ft. Hood, Texas. Team Building was the focus and participants in the program learned more about themselves, their organization and building a successful team with the help of horses. Learn more about using this great interactive experiential learning process. This two-hour video is packed with 5 different Equine Assisted Learning activities. You see Tim’s EAL facilitation techniques that elicit true change in participants and learn all the lessons the client did with the unique “Lessons Learned” section after each facilitation session. 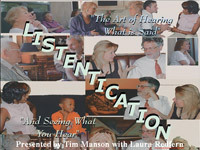 Listentication - The Art Of Hearing What Is Said, And Seeing What You Hear! To order products, please complete an order form. Winston Churchill said, “The greatest speakers make the greatest impact, with the fewest words.” Tim Manson has been a member of Toastmasters International for over 16 years and has achieved the highest educational award given by this great organization, the Distinguished Toastmaster. 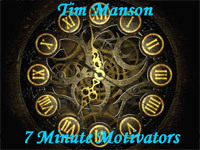 Most Toastmasters speeches are only 7 minutes in length and Tim refers to himself as, “The 7 Minute Motivator!” In this CD, Tim gives 10 of his best 7 minute motivational presentations that will make you laugh, make you cry and make you think. 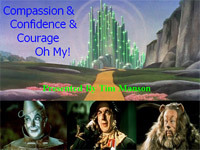 Using the characters of the beloved, “Wizard of Oz!”, Tim motivates his audience to find the gifts of Compassion, Confidence and Courage that they already have deep down inside of them. In this presentation, Tim shares the moving and inspirational story of his father’s last days and the Final Gifts he gave Tim during this special time, and encourages his audience to seek the final gifts during the last days of their own loved ones lives. Tim uses the metaphor of "rocks" as elements of time. We have all said that there is never enough time to do what needs to be done. Time management is crucial to thriving business today. 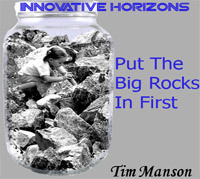 Tim shows his audience how to recognize and improve the 12 key "rocks" of successful time management at work and at home. 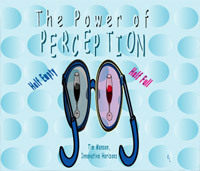 In this presentation, Tim shows us how our perceptions shape or misshape us in this lively and humorous presentation. He reveals the 3 'Laws of Perception' and shows us how we can control our perceptions, thereby improving the way in which we view ourselves, our world, and our relationships with those around us. Tim's adage of "What you Perceive is What You Receive" will become a household phrase. 2CD Set with Work Booklet! Listening skills are perhaps the most critical communication tools companies can employ for maximum performance. Unfortunately, it is one of the most misunderstood and ineffectively used communication tools that companies employ. Tim, with his co-host and financial advisor, Laura Redfern, will discuss how you can improve your listening skills both at work and at home, maximizing your organizational as well as your personal effectiveness. 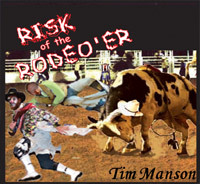 Tim believes that successful business today is just like a successful rodeo, complete with the ups and downs of some wild rides!Tim talks about his exploits as a former rodeo clown and how risk is sometimes necessary to accomplish your goals, both professionally and personally! This presentation not only discusses risk from a corporate point of view, but from a personal point of view as well. Tim compares his activities as a rodeo clown and bullfighter and providing "cowboy protection" to employees providing "company protection".